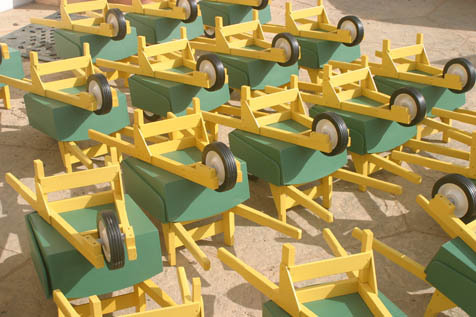 These wheelbarrows are the fruits of Adult Ed's labor. Elves might not be able to handle the noise and the dust, but it’s Santa Central all year in Room 10 at the Wake Center. Six hundred toys are turned out in this mini factory that’s a class in woodworking on Tuesdays from 9 a.m. to noon. Of course you could take a general woodworking class, but Tuesdays are special, and it’s been that way for years; here’s where table saws, routers, lathes, drill presses, band saws, and sanders of all descriptions are employed by men and women, young and old, to make beautiful toys for children whose Christmas depends on Unity Shoppe for cheer. There are trucks, wheelbarrows, doll beds; not a piece of plastic anywhere. Such toys are heirlooms, crafted with love. And the class bonds through sawdust, sweat, and donuts. The donuts are thoughtfully provided by Anna’s Bakery, the wood is donated by Channel City Lumber in Goleta, and the paint is courtesy Goleta Valley Paint. We head to Ventura Steel for truck axles, Buena Tool provides supplies, and Taco Bell gives the endless cups. It takes the effort of countless students laboring-much fun, but laboring nonetheless-all year to bring this assembly line to its glorious conclusion just after Thanksgiving. Students learn to use hand and power tools, equipment with jigs, fixtures, and gauges in a quality-control environment. It’s safety first, of course, but camaraderie rules. It’s a rare community that pulls together to give holiday joy to its less fortunate, and just another fabulous instance of Santa Barbara’s heart. And if you’ve ever hankered to get your hands on that machinery without messing up your home or garage, Adult Ed is the place to get in action. You’ll find the class listed under Home & Garden, just a ruse to keep Santa away from the donuts. Half of each class is usually composed of new students, who, Scheftic said, are often responsible for small innovations in toy assembly or cutting the pieces. Others are regulars who have been enjoying the Tuesday operation for years, contributing their time. A bead on a truck gear-shift lever may be assembled by an aerospace engineer, while a group of women take doll beds home to make bedding and stencil each one differently. More than five hours’ labor goes into every single toy, but it’s an immeasurable joy that spreads out in every direction, from creators to children and back again. Quality control labels ought to read: Manufactured in Santa Barbara with love! But then, who’d explain that to the kids waiting for Santa to squeeze himself down the chimney?